WASHINGTON (JTA) — Any good therapist will tell you: There’s pressure that hurts and there’s pressure that heals. Two weeks after President Obama promised more of the latter, establishment Jewish groups are still squirming — complaining that the pressure on Israel is unrelenting, while pressure on Arabs and the Palestinians has yet to kick in. 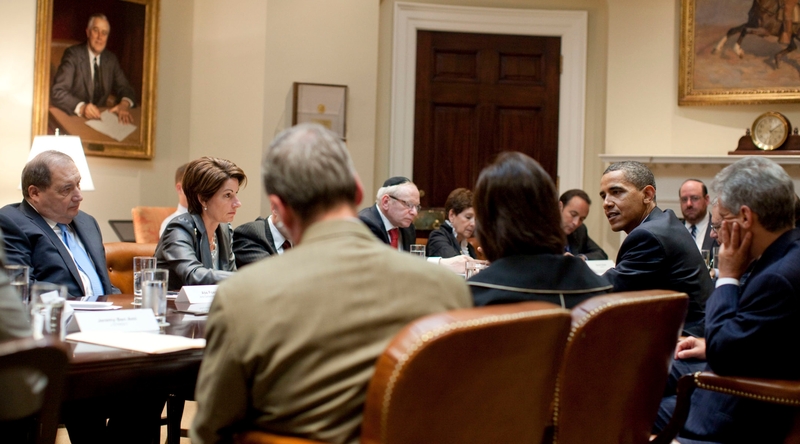 Jewish leaders, who reached out to JTA to describe in greater detail their White House meeting with the president on July 13, say they see progress, but are concerned that an imbalance persists. During the meeting, the leaders say, Obama said he had written to Arab leaders to press them on gestures that would allow Israeli Prime Minister Benjamin Netanyahu to reciprocate with similar concessions, including a settlement freeze. Obama said he would follow up with phone calls, but more than a week later there are no signs that the outreach is making inroads. Instead, reports have leaked that the Saudis, in particular, are adamant that Netanyahu must move first. Multiple times during the conversation, Obama said Arab and Palestinian leaders were “terrified” of their street. Jewish leaders at the meeting — including, notably, Lee Rosenberg, the American Israel Public Affairs Committee’s president-elect and a major backer of Obama during the presidential campaign — pushed back, saying that Netanyahu also was accountable to a skeptical public. Leaders emphasized that overall, the meeting was positive. They said Obama showed engagement and depth, and had a clear understanding of the threat posed by Iran and demonstrated a commitment to isolating the Islamic Republic until it stood down from its suspected nuclear weapons program. Especially frustrating for the leaders were Obama’s specific expectations of Israel — pre-eminently the settlement freeze — as opposed to how he used vagaries to describe his expectations of Arabs and the Palestinians. During the meeting, Foxman challenged Obama to respond directly to Mahmoud Abbas, the Palestinian Authority president, who recently told The Washington Post that Palestinians need do nothing for now, as the Obama administration presses Israel to freeze settlement construction. “Good point,” was all Obama would say. Abbas’ wait-and-see approach vexed not only the centrist pro-Israel establishment, but also dovish activists who generally back the Obama administration’s tough posture with Israel. Jeremy Ben-Ami, who directs J Street, said the recalcitrance on both sides underscored the need for an active U.S. role in the process. Within two days of the meeting with Obama, Secretary of State Hillary Rodham Clinton was delivering a speech to the Council on Foreign Affairs that emphasized expectations of the Palestinians and the Arabs, albeit in the non-specific terms that frustrated many of the Jewish leaders at the White House meeting. Notably, too, her comments on Palestinians were missing from the prepared text and appeared to have been inserted at the last minute. AIPAC is working through the Congress to redress what it sees as the White House’s imbalance: U.S. Sens. Evan Bayh (D-Ind.) and James Risch (R-Idaho) are circulating among their colleagues a letter, strongly backed by the pro-Israel lobby, that would press Obama to lean more on the Arab nations. The letter praises Netanyahu for reiterating Israeli support for two states and for easing movement for the Palestinians. It makes no mention of the U.S. calls for a settlement freeze, essentially staying out of the fight on that issue between the Obama administration and the Netanyahu government. James Zogby, the president of the Arab American Institute, challenged the logic of the letter, saying it is Netanyahu’s pressing forward on expanding some settlements that has frustrated Arab willingness to make some of the gestures for which Bayh and Risch are calling. A number of Arabs nations ready to step forward are now more reluctant in the wake of Netanyahu’s declaration last week that he will not block expanded Jewish settlement in Jerusalem, Zogby said. Zogby bristled at the pressure on the Palestinians, in particular, particularly because he sees Israel trucking with terrorist groups while ignoring moderates.